THE Ponteland community has been rocked with news of the sudden death of respected councillor Mel Armstrong. Coun Armstrong, who was born and bred in the village, died in North Tyneside Hospital of heart complications in the early hours of Monday. The 63-year-old had served on the former Castle Morpeth Council and was a member of both Northumberland County Council and Ponteland Town Council, where he campaigned strongly on local housing issues and preserving the Ponteland environment. He was Director of his own waste and haulage company, Armstrong's Effluent Disposal, and lived in Prestwick with his wife Eileen. He also leaves daughters Catherine, Bernadette and Amelia, and grandson Lincoln Robson. Catherine Armstrong paid tribute to her father. "For the family he was a fantastic Dad and husband. He was always known to have a big smile and he was loved by the whole community. He was very well known," she said. "He fought bravely, but unfortunately he had complications with his heart. The hospital staff were great and really did try to do everything for him. "Obviously the family are devastated at his death. We loved him dearly." Coun Armstrong was known as a motorbike enthusiast, having racing bikes in his youth before moving on to Harley Davidsons and becoming a member of the Harley Owners Group (HOG). He would travel to Europe and America to pursue the interest, but he also had a passion closer to home as a life-long Newcastle United supporter and had a season ticket at St James' Park in the Platinum Club. "He loved his football and had a season ticket for years. He managed to get to the last home game against Aston Villa when they won 6-0 so that would have made him very proud," said Catherine. Council colleagues also paid their respects. County Conservative Group Leader Peter Jackson said: "Mel has been a friend and a colleague for a number of years as a councillor on both Castle Morpeth and Northumberland County Council. "It is a great shock that he has been taken from us so suddenly and he will be deeply missed. "He was a character known throughout the community of Ponteland and he looked after the interests of his constituents above everything. He worked hard for the council and brought a unique combination of both good humour and good sense to all matters. "He was a man who cared a great deal about the place where he had lived all of his life and he was prepared to put the effort in to make it a better place. "He was a popular figure known to many and respected by all who met him. Our Conservative group will miss him, the commitment he has given to us and the life and vitality that he always had." He added: "Mel was a life-long Newcastle United supporter, which was known across the council because every time his mobile phone went off in a meeting it would play the Newcastle United anthem, Mark Knopfler's Local Hero. It always lightened the mood." Ponteland Mayor Robin Ramsay said: "We are all going to miss Mel very much. Although he had only been a town councillor since 2007 he has made a tremendous contribution to the running of the council and in his role as a county councillor he stood up for Ponteland's interests. "As a person he was tremendous. When he came in the room he brightened up the place. "He was a big character in many ways." 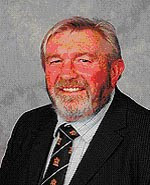 Coun Armstrong represented Ponteland East on the county council and was a member of its standards committee. Council Leader Jeff Reid said: "Mel was a man so many of us admired and respected as a genuine person above party politics and he will be very sadly missed. "He was a hard worker for his constituents and many of us will have served with him on appeals panels and know how compassionate he could be in the most difficult of circumstances." Funeral arrangements for Coun Armstrong are still to be confirmed.